It’s a wrap for C. Wonder. The troubled retailer, conceived by Chris Burch, has been struggling since reports surfaced in November that it would be closing up to 20 of its 32 locations, but it looks like cutting corners couldn’t help the flailing company. According to BuzzFeed, the company called a meeting yesterday informing employees that it would be shuttering the brand entirely and closing all remaining stores in the forthcoming weeks. Burch’s C. Wonder endeavor was seen by some as an attempt to get revenge on his ex-wife Tory Burch, since the store’s offerings looked so similar to the designer’s famed aesthetic. If you’re looking to pick up some deeply discounted C. Wonder wares while you can, now is the time. 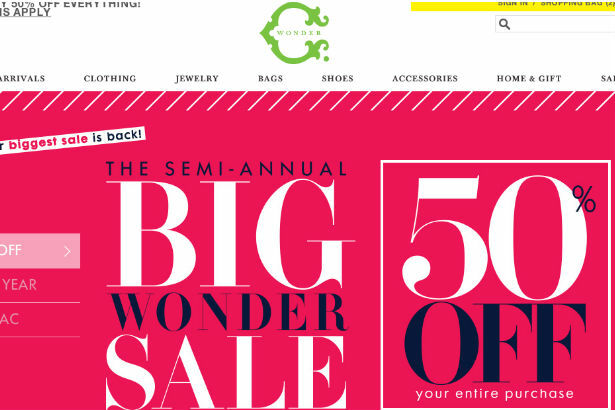 The brand’s website is taking 50 percent off your entire purchase.